A new era is dawning for the New Jersey Devils. Gone is longtime president and general manager Lou Lamoriello, who had run the team since 1987 and built New Jersey's three Stanley Cup-winning teams (1995, 2000, 2003). He's been replaced by former Pittsburgh Penguins GM Ray Shero, who brought in John Hynes, coach of the Penguins' American Hockey League affiliate, to take over behind the bench. There's a lot of anticipation about what kind of team the Devils will be under Hynes, who at 40 is the youngest coach in the League. "We want to have a real strong, structured system where there's a lot of accountability and attention to detail which keeps the puck out of your net but allows you to regain possession quicker," Hynes said. He inherits a team that was 32-36-14 last season and finished 20 points out of a spot in the Stanley Cup Playoffs. The Devils haven't played in the postseason since reaching the Stanley Cup Final against the Los Angeles Kings in 2012. Shero provided Hynes with several new pieces on offense and defense in an effort to end New Jersey's playoff drought. The Devils need to generate a lot more offense if they hope to challenge for a playoff berth; they were 28th last season with 176 non-shootout goals. A need was filled at right wing with the acquisition of Kyle Palmieri in a trade with the Anaheim Ducks on June 27. Pavel Zacha, New Jersey's first-round pick (No. 6) at the 2015 NHL Draft, will be given a chance to win a job. "There is an opportunity [to earn a roster spot], but it'll be competitive," Hynes said of Zacha, 18. "He has NHL talent. When you're bringing along a player of his age and talent, it's really the mental part. They have to be able to handle it mentally even if you can handle it physically." Left wing Stefan Matteau, who has played parts of two seasons with the Devils after being the 29th pick of the 2012 draft, is determined to remain on the roster on a full-time basis. Reid Boucher will miss the start of training camp after sustaining a concussion during the Buffalo Sabres Prospects Challenge on Sept. 12. He had one goal in 11 games with the Devils last season and 15 goals in 62 games with the Albany Devils of the AHL. Sergey Kalinin (6-foot-3, 190 pounds), who spent the past five seasons in the Kontinental Hockey League, signed in May. The 24-year-old had 12 goals, 25 points and won 50 percent of his faceoffs in 58 games as captain of Avangard Omsk last season. Hynes will rely on veterans Patrik Elias, Mike Cammalleri, Travis Zajac and Adam Henrique for support and leadership in the locker room and on the ice. "You need to have your best players buy in and serve as the hardest workers and leaders to drive your team to a certain level of focus," Hynes said. Center Jacob Josefson had NHL bests in goals (six), points (11) and games played (62) in 2014-15 and should fill a bottom-six role. Center Stephen Gionta has thrived in a fourth-line role at center, and wings Jordin Tootoo and Tuomo Ruutu will provide their usual energy and enthusiasm. The Devils also signed Jiri Tlusty to a one-year, one-way contract on Sept. 16, and invited Tyler Kennedy and Lee Stempniak to camp on professional tryout agreements. The defense will be led by veteran Andy Greene. The 32-year-old had 22 points, averaged 23:32 of ice time and had a plus-1 rating in 82 games last season. Adam Larsson, the fourth pick of the 2011 draft, led Devils defensemen in assists (21) and points (24) in 64 games last season and took a major step forward in the second half. The Devils showed their faith in Larsson on July 25 when he signed a six-year contract. The Devils are counting on three other young defensemen, Damon Severson (21), Eric Gelinas (24) and Jon Merrill (23), to further their development this season. "Part of my job is to understand that any time these guys make a mistake I can't get frustrated, get on them or complain about it because they are learning and getting better," Devils goaltender Cory Schneider said. "It's getting to the point where they're going to be playing a lot, have prominent roles on this team and they're going to have to make that jump eventually." Shero moved to bolster the defense when he signed 24-year-old John Moore to a three-year contract July 1, and 28-year-old David Schlemko to a one-year, one-way contract Sept. 10. Marc-Andre Gragnani, a 28-year-old with 74 games of NHL experience who spent last season playing in Switzerland, signed a one-year, two-way contract July 3. With the retirement of Bryce Salvador earlier this month, a spot could be open for Seth Helgeson or Raman Hrabarenka, who had short stints with the Devils last season, or Vojtech Mozik, who signed June 15 after four seasons playing professionally in the Czech Republic. Schneider had a 26-31-9 record, but his 2.26 goals-against average and .925 save percentage were superb. Schneider's save percentage was fifth in the NHL among goaltenders who played 35 or more games. On most nights he was New Jersey's best player. "Cory and strong goaltending gives you a chance every night to be a competitive team," Hynes said. "We need to surround him with a good structure defensively and put in work on offense." Keith Kinkaid proved to be a capable backup last season. He was 13-6-5 with a 2.59 GAA and .915 save percentage in 19 games. The Devils' power play was eighth in the League last season at 19.3 percent. Cammalleri led with nine goals and Henrique had five goals and 11 assists. Hynes and new assistant coach Geoff Ward, who will handle the power play, will look to continue that success. The Devils were 26th in the League in on-ice scoring chances-for per 60 minutes (42.7) on the power play, according to war-on-ice.com, so there is room for improvement. The penalty-killing unit, which was first in the NHL in 2013-14, fell to 21st last season at 80.6 percent. Hynes and assistant coach Alain Nasreddine, who will oversee the defense and penalty kill, will look for improvement. Nasreddine spent the past five seasons as an assistant under Hynes with Wilkes-Barre/Scranton in the AHL, and his defense corps allowed the fewest goals in the AHL four times. Josefson led the Devils with three shorthanded goals, followed by Cammalleri and Zajac with two each. 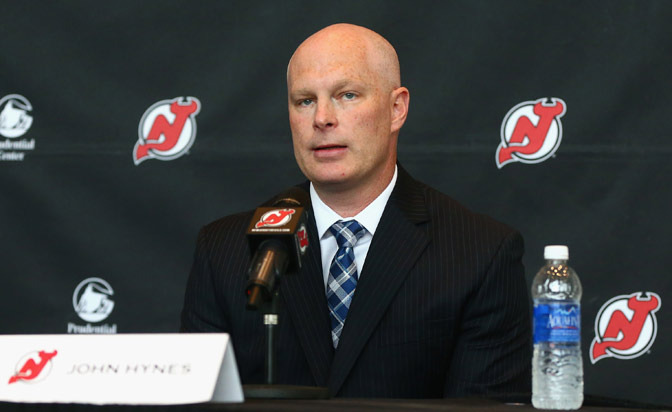 Hynes is the Devils' fourth coach in five years. He replaced co-coaches Lamoriello, Scott Stevens and Adam Oates, who had taken over behind the bench after Peter DeBoer was fired in December. Hynes aims to have his team organized to play fast, aggressive hockey. But change doesn't happen overnight, and patience is needed while his players gain confidence within the new structure. "He'll be the youngest coach in the League and we'll be a young team, so he'll be able to connect with those guys at a good level," Schneider said. "I think for the most part everyone is excited to have a clean slate. I know as a group we didn't play well enough last year so a lot of guys are excited to have a new set of eyes, a new lease on life, to start fresh. I believe there is a new energy."